A beautiful Victorian gilt and silver plated copper jewellery casket in the manner of Elkington, date: circa 1870. 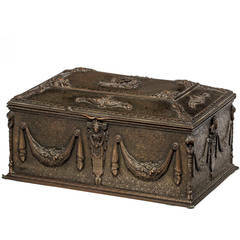 The rectangular casket features superb cast plaques which feature reclining nudes with masks and is raised on corner ribbon feet. 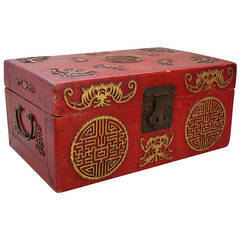 Add an elegant touch to your home with this lovely casket. Condition: In excellent condition, please see photos for confirmation. Dimensions in cm: Height 10 x width 17 x depth 10.5 Dimensions in inches: Height 3.9 x width 6.7 x depth 4.1. 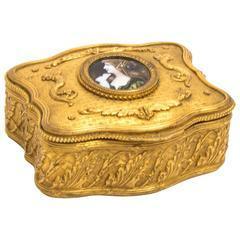 Finest quality French 19th century bronze doré box. Beautiful scenes of cherubs at play on all sides. Boucher scenes. Lined with a beautiful silk original key. 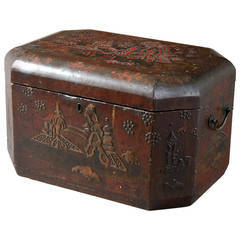 An exceptionally fine tortoiseshell and gilt bronze casket of waisted Bombay form. With original gilt bronze mounts all now patinated. In a quite exceptional condition. 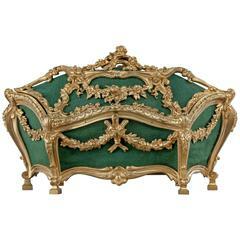 French bronze domed top Casket, the background decoration of very finely formed vines, garlands and neo-classical beads to the four sides. Very fine mid-19th century gilt bronze casket of complex Rococo form, decorated with foliage wreaths and flowers. A rare antique French gilt bronze and silver Sevres porcelain casket finely painted with neoclassical figures on two round and two rectangular plaques.